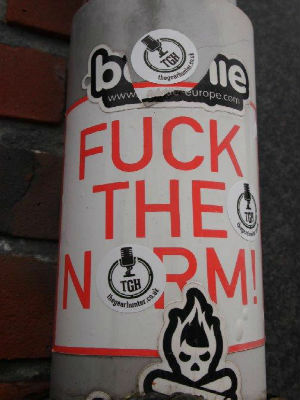 TGH’s global marketing campaign continues to gather momentum, with wor canny little stickers currently popping up all over the spot. Delighted to report Double Dutch sightings of the darza little discs this week. Chee-az! to Shorita van der Laan, from Utrecht, who snapped a TGH endorsement of a day of anti-fascist action in the Netherlands – and Lesley M, who has the distinct good fortune to dwell in Den Haag. She spotted TGH lighting up a lamp-post by the harbour in Scheveningen.